I have today found a great website by Tim Sheppard. A name that has significant meaning for me from my past; I am feeling very reminiscent at the moment. I guess, that is, having just turned 45; I am now, half way through my life. Tim was the name of my first ‘real’ boyfriend who was good friends with a guy called David Sheppard aka Dinky. He married my friend Patsy, had two kids and lived happily ever after. And I pause …. Of course, when I am writing I can pause in any number of ways: the colon as here, or the semi, a comma, or indeed a series of dots – what are they called? Oh yes, and the dash! The question that Twain now awakens is what punctuation depicts the right pause length? 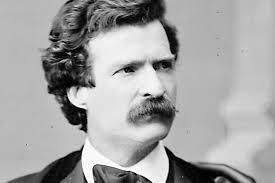 Please carry on telling me your great stories or indeed debate with me what Twain dictates. If, however, you don’t like sharing, yet love my Blogs, then click on comment and RSS to get an automatic update when I have posted something new.